When you move into a new home, you want everything to go smoothly. That’s why buyers get home inspections, after all. But sometimes, you’re not able to test every element of a home, and something goes wrong after the purchase. Items like kitchen appliances, for example, may have worked perfectly fine during an inspection but suddenly fail weeks or months after purchasing the home. And it’s not just new homeowners who have trouble with home appliances! Current homeowners may have had no problems for years, only to wake up to a leaking freezer or unresponsive oven. Knowing what to do in a situation like this can be the difference between a cost-effective and quick repair, or buying a whole new appliance. Before you panic, check to see if the appliance is actually broken! Especially if you just bought a new home, there may be a quirk to how the item works. Check for switches and make sure it’s turned on – and of course, check to see if it’s plugged in! You’ll also want to check the outlet itself to make sure it’s providing electricity to the appliance. Check your circuit breakers or fuses, and check the outlet itself with a voltage tester. Check any vents and filters on the appliance to make sure they’re clear. Finally, check the appliance for a reset button. You may be able to quickly revive an appliance by simply resetting it, or by unplugging it and plugging it back in again. 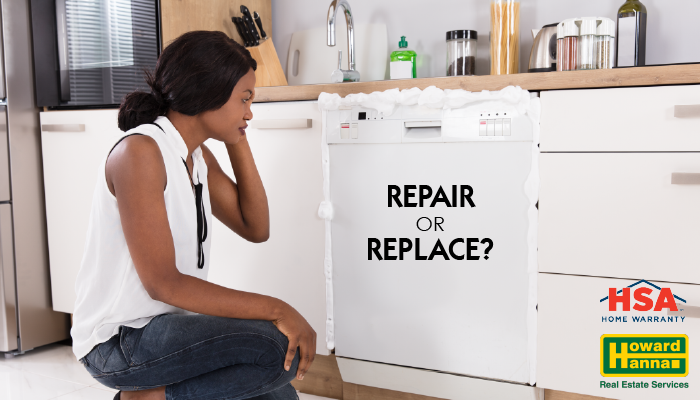 Should your appliance be repaired or replaced? A good rule of thumb is that if repairs will cost more than half the value of the appliance, you’re better off getting it replaced. You should also factor in the availability of repair parts and knowledge. You may be unable to find parts for older appliances, or may not be able to find somebody who knows how to fix it. Finally, think about whether the appliance has all the features you want. If an upgrade would be welcome, and a repair costly, it may make more sense to simply replace the appliance. If you opt to have your appliance repaired, you’ll want to make sure you’re working with a reputable vendor. Identify either a manufacturer repair person or a company that you trust. Looking at online reviews can help you determine the right company to work with. Consider calling a few different service professionals to identify the right fit for you. At Howard Hanna, we want you to feel secure in your investment. Whether you are selling, buying, or currently own a home, an HSA Home Warranty can help protect your investment and give you some peace of mind should a failure occur. The home warranty is a one-year service agreement that helps protect your budget against unexpected costs associated with repairing or replacing the major system components and many appliances in your home. Want to know more about how a home warranty can help you? Visit our HSA Home Warranty page to learn more.